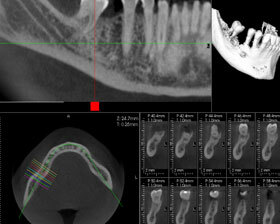 SkyView is the fastest way to approach 3D radiography from within the dental practice. SkyView is the three-dimensional evolution of a panoramic imager tailored to today’s dental surgeon who requires increased potential with regard to radiology. The software guided procedure enables dental professionals to acquire quality images in fast easy steps. Ideal for achieving 3D reconstruction of the dentition and jaw, it also elaborates excellent panoramic images via dedicated software. Calibration is performed at the time of installation by MyRay professionals. From this moment on you will never look back. SkyView is designed for the dentist who needs to focus on each patient, not on technical issues regarding the instruments used. SkyView incorporates a modern image-intensifier detector which ensures top image quality at low dosage rates. This means your patients are exposed to far fewer risks. SkyView uses a latest generation double field 6-inch detector offering maximum contrast and maximum definition. Extra-high resolution acquisition can be achieved by reducing the visual field from 9 to 4 inches. Rotation during the 10/15/20 second scan cycle is through 190°. 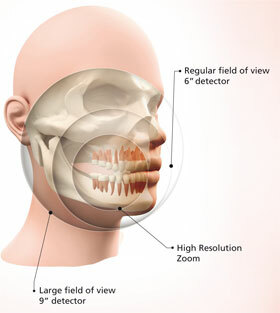 With an 11 cm diameter spherical field of view, SkyView can produce high-resolution images of the entire adult dentition zone, with minimal X-ray doses. The field of view can, however, be translated so as to frame other areas of interest, such as the temporomandibular joints. Recommended for X-ray and image-based diagnosis centres, the 15 cm diameter spherical field of view allows the entire maxillofacial region to be framed in a single scan. 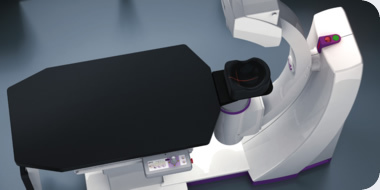 A variable beam collimation (Zoom HR) system allows the field of view to be narrowed as required to allow higher-resolution focussing on smaller anatomical regions. Thanks to a compact footprint and trim design with a fold-away limb section, SkyView will fit into small surgeries nearly as easily as stand-up panoramic equipment. Triple axis control via PC or via a patient-table-mounted joystick allows for fast, precise and comfortable positioning.